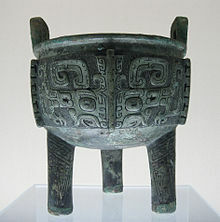 Chinese ritual bronze, a Late Shang dǐng. Benin bronze of a woman's head. Gilt-bronze doors of the Baptistry of Florence Cathedral (Lorenzo Ghiberti, 1401-22). 9th-century bronze vessel in form of a snail shell excavated in Igbo-Ukwu,(part of igbo tribe in Nigeria). Common bronze alloys have the unusual and desirable property of expanding slightly just before they set, thus filling the finest details of a mould. Then, as the bronze cools, it shrinks a little, making it easier to separate from the mould. Their strength and ductility (lack of brittleness) is an advantage when figures in action are to be created, especially when compared to various ceramic or stone materials (such as marble sculpture). These qualities allow the creation of extended figures, as in Jeté, or figures that have small cross sections in their support, such as the equestrian statue of Richard the Lionheart. But the value of the bronze for uses other than making statues is disadvantageous to the preservation of sculptures; few large ancient bronzes have survived, as many were melted down to make weapons or ammunition in times of war or to create new sculptures commemorating the victors, while far more stone and ceramic works have come through the centuries, even if only in fragments. As recently as 2007 several life sized bronze sculptures by John Waddell were stolen, probably due to the value of the metal after the work has been melted. There are many different bronze alloys, and the term is now tending to be regarded by museums as too imprecise, and replaced in descriptions by "copper alloy", especially for older objects. Typically modern bronze is 88% copper and 12% tin. Alpha bronze consists of the alpha solid solution of tin in copper. Alpha bronze alloys of 4–5% tin are used to make coins and a number of mechanical applications. Historical bronzes are highly variable in composition, as most metalworkers probably used whatever scrap was on hand; the metal of the 12th-century English Gloucester Candlestick is bronze containing a mixture of copper, zinc, tin, lead, nickel, iron, antimony, arsenic with an unusually large amount of silver – between 22.5% in the base and 5.76% in the pan below the candle. The proportions of this mixture may suggest that the candlestick was made from a hoard of old coins. The Benin Bronzes are really brass, and the Romanesque Baptismal font at St Bartholomew's Church, Liège is described as both bronze and brass. In the Bronze Age, two forms of bronze were commonly used: "classic bronze", about 10% tin, was used in casting; and "mild bronze", about 6% tin, was hammered from ingots to make sheets. Bladed weapons were mostly cast from classic bronze, while helmets and armour were hammered from mild bronze. According to one definition, modern "statuary bronze" is 90% copper and 10% tin. Chola bronze of Queen Sembiyan Mahadevi as the goddess Parvati. The great civilizations of the old world worked in bronze for art, from the time of the introduction of the alloy for tools and edged weapons. Dancing Girl from Mohenjodaro, belonging to the Harappan civilization and dating back to c. 2500 BCE, is perhaps the first known bronze statue. The Greeks were the first to scale the figures up to life size. 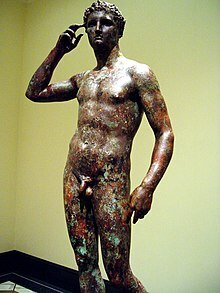 Few examples exist in good condition; one is the seawater-preserved bronze Victorious Youth that required painstaking efforts to bring it to its present state for museum display. Far more Roman bronze statues have survived. The ancient Chinese knew both lost-wax casting and section mould casting, and during the Shang dynasty created large numbers of Chinese ritual bronzes, ritual vessels covered with complex decoration, which were buried in sets of up to 200 pieces in the tombs of royalty and the nobility. Over the long creative period of Egyptian dynastic art, small lost-wax bronze figurines were made in large numbers; several thousand of them have been conserved in museum collections. Sri Lankan Sinhalese bronze statue of Buddhist Alakothiveshwara Tara Devi statue, now in England, is an excellent example of Bronze statues. From the ninth through the thirteenth century the Chola dynasty in South India represented the pinnacle of bronze casting in India. Making bronzes is highly skilled work, and a number of distinct casting processes may be employed, including lost-wax casting (and its modern-day spin-off investment casting), sand casting and centrifugal casting. The term "bronze" is also applied to metal sculptures made by electrotyping (or galvanoplasty), although these sculptures are typically pure copper and their fabrication does not involve metal casting. In lost-wax or investment casting, the artist starts with a full-sized model of the sculpture, most often a non-drying oil-based clay such as Plasticine model for smaller sculptures or for sculptures to be developed over an extended period (water-based clays must be protected from drying), and water-based clay for larger sculptures or for sculptures for which it is desired to capture a gestural quality - one that transmits the motion of the sculptor in addition to that of the subject. A mould is made from the clay pattern, either as a piece mould from plaster, or using flexible gel or similar rubber-like materials stabilized by a plaster jacket of several pieces. Often a plaster master will be made from this mould for further refinement. Such a plaster is a means of preserving the artwork until a patron may be found to finance a bronze casting, either from the original moulds or from a new mould made from the refined plaster positive. Once a production mould is obtained, a wax (hollow for larger sculptures) is then cast from the mould. For a hollow sculpture, a core is then cast into the void, and is retained in its proper location (after wax melting) by pins of the same metal used for casting. One or more wax sprues are added to conduct the molten metal into the sculptures - typically directing the liquid metal from a pouring cup to the bottom of the sculpture, which is then filled from the bottom up in order to avoid splashing and turbulence. Additional sprues may be directed upward at intermediate positions, and various vents may also be added where gases could be trapped. (Vents are not needed for ceramic shell casting, allowing the sprue to be simple and direct). The complete wax structure (and core, if previously added) is then invested in another kind of mould or shell, which is heated in a kiln until the wax runs out and all free moisture is removed. The investment is then soon filled with molten bronze. The removal of all wax and moisture prevents the liquid metal from being explosively ejected from the mould by steam and vapour. Students of bronze casting will usually work in direct wax, where the model is made in wax, possibly formed over a core, or with a core cast in place, if the piece is to be hollow. If no mould is made and the casting process fails, the artwork will also be lost. After the metal has cooled, the external ceramic or clay is chipped away, revealing an image of the wax form, including core pins, sprues, vents, and risers. All of these are removed with a saw and tool marks are polished away, and interior core material is removed to reduce the likelihood of interior corrosion. Incomplete voids created by gas pockets or investment inclusions are then corrected by welding and carving. Small defects where sprues and vents were attached are filed or ground down and polished. 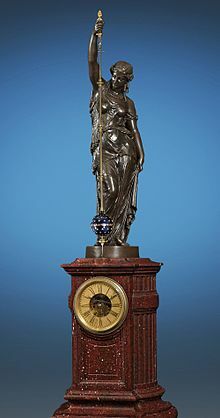 A monumental conical pendulum clock by Eugène Farcot with a patinated bronze statue. For a large sculpture, the artist will usually prepare small study models until the pose and proportions are determined. An intermediate-sized model is then constructed with all of the final details. For very large works, this may again be scaled to a larger intermediate. From the final scale model, measuring devices are used to determine the dimensions of an armature for the structural support of a full-size temporary piece, which is brought to rough form by wood, cardboard, plastic foam, and/or paper to approximately fill the volume while keeping the weight low. Finally, plaster, clay or other material is used to form the full-size model, from which a mould may be constructed. Alternatively, a large refractory core may be constructed, and the direct-wax method then applied for subsequent investment. Before modern welding techniques, large sculptures were generally cast in one piece with a single pour. Welding allows a large sculpture to be cast in pieces, then joined. After final polishing, corrosive materials may be applied to form a patina, a process that allows some control over the colour and finish. Another form of sculptural art that uses bronze is ormolu, a finely cast soft bronze that is gilded (coated with gold) to produce a matte gold finish. Ormolu was popularized in the 18th century in France and is found in such forms as wall sconces (wall-mounted candle holders), inkstands, clocks and garnitures. Ormolu wares can be identified by a clear ring when tapped, showing that they are made of bronze, not a cheaper alloy such as spelter or pewter. ^ a b Caleb Hornbostel, Construction Materials: Types, Uses and Applications, Second Edition (New York: John Wiley & Sons, 1991) p. 175. ^ "National Museum, New Delhi". www.nationalmuseumindia.gov.in. Archived from the original on 2015-09-16. ^ "Chola Bronzes. Asiatic Society". Asia Society. Archived from the original on 2009-12-31. ^ Scott, David A. (2002). Copper and bronze in art: corrosion, colourants, conservation. Getty Publications. ISBN 978-0-89236-638-5. Some extremely important commissions were made in electrotypes, such as the "bronzes" that adorn the Opera, Paris, and the 320 cm high statue of Prince Albert and four accompanying figures, erected behind the Albert Hall in London as a memorial to the Great Exhibition of 1851. The Prince Albert statue was electrotyped by Elkington & Company of Birmingham, England, in 1861 and has recently been restored. Note that the Memorial to the Great Exhibition was originally erected in the garden of the Royal Horticultural Society, and moved to its present location around 1890. Wikimedia Commons has media related to Bronze sculptures. "Flash animation of the lost-wax casting process". James Peniston Sculpture. Retrieved 2007-10-24.